Colt Lyerla — Will He Get a Second Chance? Just about everyone is familiar with the “Big Three” when referring to GM, Ford and Chrysler; LeBron James, Dwyane Wade and Chris Bosh; or the folk band, The Big 3. Likewise, Oregon now has its own “Big Three,” which consists of former players who didn’t do the right things when they were Ducks. 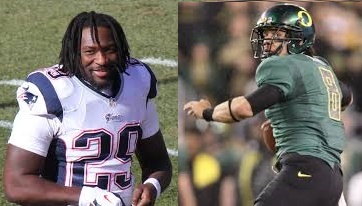 The trio consists of troubled players Jeremiah Masoli, LeGarrette Blount and Colt Lyerla. Even though Oregon isn’t known for having many “bad Ducks” who get into legal trouble, suspended or booted from the team, they do have three high profile former players who are guilty of those things. One of those players, Masoli, is currently a backup QB in the CFL – Canadian Football League. Blount is an NFL RB who recently won a Super Bowl ring with the New England Patriots. But what about Lyerla? He went undrafted in the 2014 NFL Draft due to having a tumultuous college career that ended when he quit the team and was found in possession of cocaine thereafter. However, because of his glaring talent, he was signed by the Green Bay Packers despite his previous problems. Unfortunately, Lyerla blew out a knee with MCL and PCL tears after attempting to hurdle defender, Jumal Rolle, during a Family Night practice session at Lambeau Field. 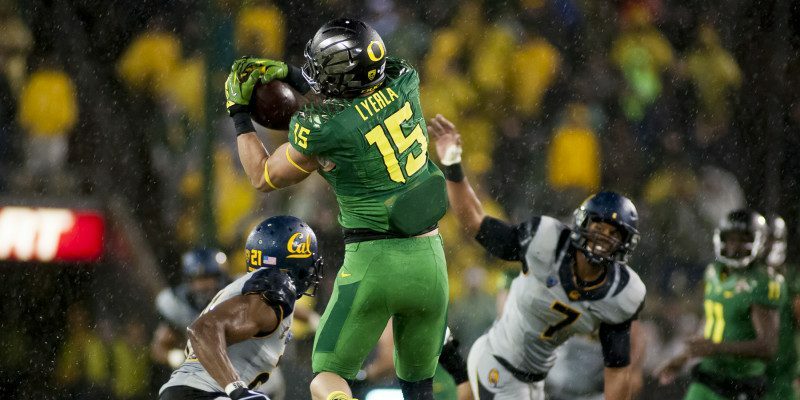 Less than two weeks after signing an injury settlement and waived by the team, Lyerla was arrested on September 7, 2014, for a DUI charge – which was later dismissed. Despite his issues, Lyerla is still an amazing talent. Fast-forward eight months and Lyerla is pleading, almost begging for another chance. In a video he made to state his case, Lyerla addressed his previous issues by saying, “… there have been a lot of bad decisions made in the past …” and “it’s going to stay in the past.” Then he revealed that he has been in a substance abuse program for the last year and hasn’t failed any drug tests — which is interesting, since he was arrested for the DUI only eight months ago. Lyerla also quoted Chip Kelly by saying that he is just trying to “win the day” and to keep winning days so he can make a 2015 NFL roster. While he certainly has a difficult road ahead of him, it isn’t far-fetched to think he could make a roster — after all, he has all the abilities an NFL coach desires in a TE. Ultimately, the biggest issue for Lyerla going forward is the many bridges he burned in the past. 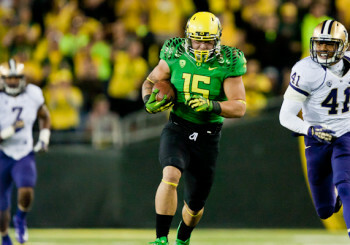 Considering their history at Oregon and perhaps as a favor, would Kelly bring him in for a workout? The same can be asked of the Packers head coach, Mike McCarthy, regarding a second chance. At the very least, Lyerla has to stay off of the weed, coke and any other illegal substances. The future hangs in the balance for him, as there aren’t many teams willing to give second chances for past transgressions such as his.